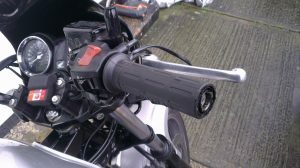 When we bought Mary’s CBF500 it came with a cheap set of heated grips fitted, very handy for the winter. However, their installation was critically bodged. The grips were glued on using a rubber type grip glue, which although fine whilst the grips were cold, when hot the glue became tacky and no longer adhesive. Thus when twisting the throttle, the grip would slip round, and not rotate the throttle! To address this, I consulted internet wisdom and opted for the double side carpet tape method. Removing the existing grip was easy once I had heated it up. I then cleaned everything up and then wrapped the double side carpet tape around the throttle body. To allow the grip to slide over the sticky tape, I popped a spot a petrol over the tape to make it temporarily slippery. Once the grip was slid back into place, the petrol evaporated allowing the tape to stick the grip firm. Job done! Or so I thought. The carpet tape also goes tacky when hot and allowed the grips to twizzle around the throttle. Pants. 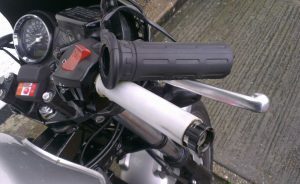 I ordered some Renthal G101 heated grip glue, which is what R&G supply with their heated grips. Of course, I had to clean the residue of the previous attempt, degrease and ensure the surfaces to bond were spotless. The yellowy glue smeared on easily enough, albeit a little on the runny side. Pushing the grip back on caused quite a bit of excess to clump up near the switch gear, which needed cleaning up to ensure the throttle still twisted freely. The instructions specify leaving the grip untouched for at least 8 hours. The next day Mary took the bike out, with the heated grips on. She reported a hell of stink coming from the glue before the glue failed just 2 miles down the road. Even worse than the carpet tape! After the abysmal failure of the Renthal glue, I opted for some two-part epoxy glue. Rated for a temperatures range of -40°C – 180°C, and good for all kinds of materials, I figured this would surely do the job.